Learn more about the EAC Heritage Collection on the EAC website. You will find details about how you can request items for your Chapter to use at exhibits and shows! 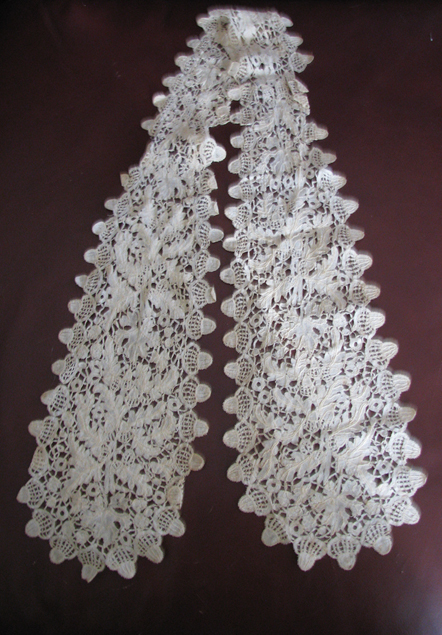 DESCRIPTION: an ecru coloured lappet or head scarf of lace, Honiton or Duchesse technique. The edge consists of a series of acorns. There is a three-dimensional effect on some leaves along the vein lines. a lappet was first worn across the top of a woman’s head under a cap. It has a narrow area in the center and widens at each end as it would have hung down over the lady’s ears or shoulder area. 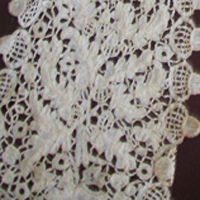 there have been recent discussions on the lace lists about why it was worn. It is thought to have helped cover the hair when it had not been washed for a while, or dressed. CONDITION: fair, at least two areas in the central portion where the ‘acorns’ are broken and a few areas where the ‘bridges’ between the motifs are missing or broken. Learn more about lappets on Wikipedia. There is also a romantic article by the Lace Curator, Elizabeth Kurella, about the piece she has called, the "Hothouse Lappet." Check the rest of her site for lots of lace love!